http://carlisletheacarlisletheatre.org/wp-login.php Enjoy a wide variety of articles, cartoons, and other postings designed just for you, cat lover! http://carlisletheacarlisletheatre.org/wp-login.php Sign up to get our new blog posts delivered right to your inbox! It’s 11:00PM. You’re up against a deadline to finish a report for work. You’ve just belted down a strong cup of coffee and you’re on the home stretch. One more section to go and you’re done! Hmmm, you think to yourself, the cats have been amazingly quiet. Just as you touch your keypad, something distracts you out of the corner of your eye. You glance over your shoulder. 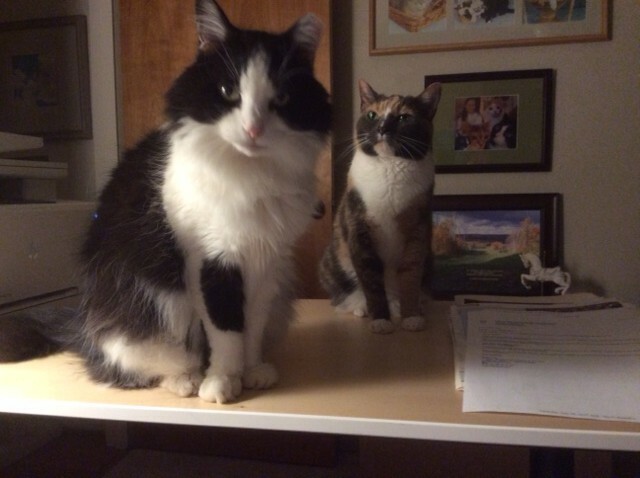 There they are – both of them – perched atop your side desk, staring at you. Their stare isn’t just any casual gaze. Their eyes are large, round, intense and compelling, their stare unwavering. You know what they want – your undivided attention! What is it about cats that drive you to stop whatever you’re doing, and attend to their every whim? Cats are intelligent creatures. Once they figure you out (which doesn’t take very long), you’re putty in their little paws. They know exactly what to do and they do it. If you make the fatal mistake of catering to them the first time, they will repeat the process again and again, and you’re hooked. Here are just a few of the many techniques employed by the cats in my household (or, should I say, theirs). The Stare Down. It works every time. It elicits a response something like, “Hey cutie, what is it? What do you want?” Bingo! The Wait. They wait patiently in the kitchen until they see a human approach. From that point forward, it’s a steady litany of me-owwws, some extremely lengthy and desperate. They don’t let up until you put the food bowls down, with their dinner just the way they like it. Success! The Hit and Run. You’re reading a magazine on the couch, your collection of magazines neatly stacked in front of you on the coffee table. Out of the blue streaks a wild cat, leaping onto the stack, scattering them halfway across the room. You slap down the magazine and get up to fix the mess. The me-owwws start, with longing looks towards the kitchen. Mission accomplished! The Heart Stopper. This works something like the Hit and Run, only you’re lucky to survive. In the middle of the night, you’re experiencing a deep REM sleep. Your feline 757 lands with a thundering thud on the bed, skipping to the end of the runway, heading directly into your face. Not only do you wake up with heart palpitations, you wake up to a set of wild, black pupils staring into yours. After convincing yourself it’s not a nightmare, you desperately try to fall back asleep. That’s when they repeat. You get up. They me-owww, you follow them, tripping down the stairs into the kitchen. This is a win-win (for the cat, not for the two of you)! If you haven’t yet experienced any of the above, it’s probably because you have cats that have employed other techniques that have proven successful, or else you’ve just adopted a cat today who hasn’t yet figured you out. Don’t worry – he’ll have you “trained” by the end of the week, and you won’t even know it! Of all the listed cat names, there has been a Simba and a Sammi in our lives. LOL! Glad you’re adding the “stop, drop and roll”. They especially like to employ this technique on a stairway. Previous Previous post: Wanted: Cats Who Act Like Like Dogs- Why Not Cats Who Act Like Cats?